Many positive results have been obtained since China implemented a total ban on ivory processing and sales in its domestic market in January last year, according to scholars and relevant institutions. A new public campaign has been launched nationwide by China Customs and the National Forestry and Grasslands Administration (NFGA) with non-profit organizations WildAid and the World Wildlife Fund (WWF), aiming to reinforce the ivory ban in tourism ahead of the upcoming holiday season. "China has set an example for the world in wildlife protection and shown the determination of a responsible stakeholder on the global stage," said Dr. Sun Quanhui, science officer of World Animal Protection, a United Nations general consultative organization. Since domestic sales of ivory were banned in China, there's been a clear decline in illegal sales and demand for ivory on the mainland, according to surveys released by TRAFFIC and WWF in September 2018. Several months after the ban was enacted, a 90-percent of the public surveyed stated support for the ban, and within 12 months ivory consumption had decreased in a significant manner, reported by the WildAid. Twelve percent of respondents claim to have purchased ivory in the first 6 months since the ban, compared to 26 percent of respondents who reported doing so in a similar 2017 pre-ban survey, a 54 percent decline, according to the TRAFFIC-WWF survey. "The change has been notable," Sun said. "The public demand for ivory products has largely gone down as has poaching and ivory traffic." On the other hand, a huge rise has been seen in the society's protection awareness of endangered wildlife. "China's ivory ban shows the determination of a responsible nation and sets an example for the world in wildlife protection ... The ban was the most extraordinary measure that the world has seen to protect wild elephants," Sun said. WildAid also praised China's efforts in enforcing the ban on both domestic and international levels. In 2018, China's National Forestry and Grasslands Administration (NFGA) had worked with diplomatic, cultural, customs and market surveillance departments to carry out inspections and promotions in major municipalities and provinces including Beijing, Tianjin, Hubei, Yunnan, Fujian, Zhejiang and Guangdong. Chinese authorities including NFGA and the customs have collaborated on organizing campaigns in several African countries such as Tanzania, Mozambique, Zambia, Uganda and Ethiopia, urging the public to stay away from the illegal trade of wildlife products. For three years straight, China customs has been cracking down on wildlife trafficking in "Sword at the National Gate" operations alongside forestry, public security and commerce authorities. A number of international organized criminal groups were busted during the joint actions. 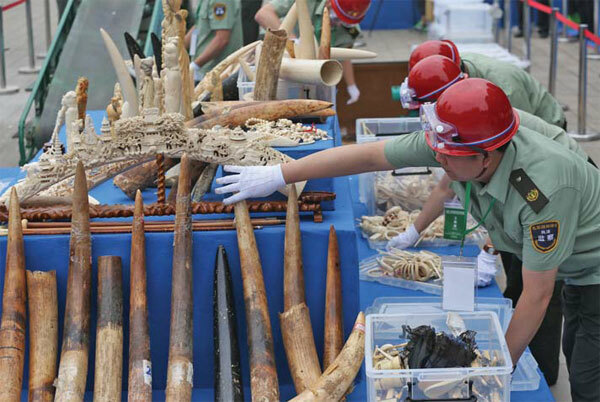 In July 2017, two major ivory traffic rings were dismantled with 22 suspects arrested in Maoming and Putian, in the southern provinces of Guangdong and Fujian. They were accused of smuggling tons of ivory worth over 100 million yuan ($14.7 million) from Africa through China's neighboring countries. "China's total ban on the ivory trade is a milestone achievement in the history of elephant protection and a most extraordinary measure taken in the global efforts of wildlife protection in recent years," Sun said. It has been proven in practice that only by cutting and restraining market demand for wildlife products could the endangered species be protected effectively. Early this week, a new campaign to remind outbound tourists not to purchase ivory products was launched jointly by China Customs, NFGA, WildAid and WWF. The campaign warns that "souvenirs could be contraband." In the new public awareness campaign, popular Chinese actor Huang Xuan, dressed as a customs officer, informs travelers that purchasing wildlife products is driving certain species toward extinction and reminds them that it is illegal to bring ivory into China, even as souvenirs. The campaign came as part of a three-year initiative by China customs to tighten security at borders and halt imports of illegal wildlife products. Since 2018, customs has made two trips to Africa to extradite Chinese nationals involved in wildlife smuggling, according to the WildAid. Study shows that more than 18 percent of outbound travelers bought ivory products on trips abroad, with Thailand and Hong Kong being the top two markets. Other destinations popular with Chinese travelers are also of concern. The new public awareness campaign will appear on public media and customs entry and exit points at airports, train stations and border crossings, particularly where China borders Myanmar, Laos and Vietnam, in hopes of countering the trend of tourists shopping for wildlife products. "WildAid brings decades of experience delivering high-impact media campaigns to protect wildlife to this partnership," said CEO of WildAid Peter Knights. "We've seen how these campaigns generate results in increased awareness and reduced consumption of wildlife products such as shark fin." "WWF's goal is to reach Chinese travelers who have the means to buy ivory and access to it in popular destinations where ivory can still be found," said Jan Vertefeuille, senior director for advocacy at the WWF. "This campaign is the kind of collaboration we need between government agencies and conservation groups to get the word out that ivory is illegal to bring home and is not socially acceptable," said the director. "China and the international community should stay focused on species protection and step up joint efforts to end wildlife traffic on a global scale," Sun said. Follow China.org.cn on Twitter and Facebook to join the conversation. Racist, abusive and off-topic comments may be removed by the moderator.